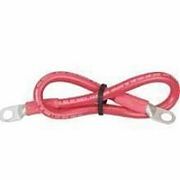 Boatersland Marine > Electrical > Electrical Parts > Wire & Cable > Marine Battery Cable > Ancor 189147 Red 2 Gauge Battery Cable - 48"
Ancor 189147 Red 2 Gauge Battery Cable - 48"
Are manufactured with Ancor's premium UL1426 tin copper battery cable. Flame retardant, UV inhibited, rated to 600V and 105 degrees Celsius. Lugs are tin copper to avoid corrosion and last longer. Each end has a piece of Ancor's adhesive lined 3:1 heat shrink tubing placed over the electrical connection. The heat shrink tubing seals out moisture and other corrosive elements found in the marine environment.